"If you don't eat your <insert-vegetable-or-fruit-name here>, I will come back as a giant <insert-same-vegetable-or-fruit-name here> to haunt you after I die." "You may not get up from the table until you eat at least three of those pieces of broccoli." 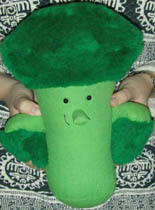 Once upon a time, when I was a little girl, I had a stuffed broccoli. It was green and had a round nose and two little eyes and a smile and it had arms that were also stalks of broccoli. For companions, it apparently had little plushy peas that could be taken out or put into their pod. I have no recollection of this broccoli. But I know it existed, because there are pictures of it. And as an adult, I find it rather sad that I lost it somewhere. Especially since it was always such a battle to get me to eat my broccoli, or any other green vegetable that wasn't cucumbers. I don't know quite what the point of the broccoli was; perhaps it was to make me eat vegetables. It didn't work, though. The only thing that fixed the whole won't-eat-vegetables problem was a lot of stubborn commentary by my parents and other adults, and me getting older. Regardless, I still think the idea of a stuffed broccoli is neat. 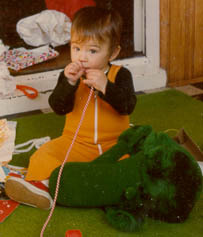 And of course, now that I am old enough to appreciate that broccoli that I once had...it cannot be found. Looney Labs decided to clone their mascot, Tirade, who happens to be a stuffed broccoli. But they made too many clones, and so they had to find the new clones good homes. Eric knew I would not let bad things happen to a second stalk of broccoli, so now I have my very own stalk. He was number 15 out of the vats...err, sewing machine, and his name is Mr. Eat-Your-Vegetables. 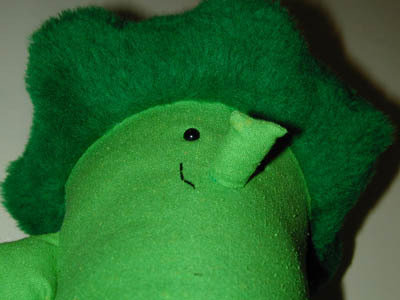 He is a happy stalk of broccoli who does a pretty good impression of Godzilla smashing Tokyo. I have a stuffed broccoli. His name is Mr. Eat-Your-Vegetables.